It looks like everyone in Raleigh has been keeping to their fitness goals. (Can you say packed gym!? But seriously, the North Hills Fitness Connection gym has reached its maximum capacity.) But, how are YOU doing on your 2016 fitness resolutions or mantra? While I secretly despise the overcrowded gym, I am very proud of everyone for making it an entire month with their New Year’s fitness goals. But how long will you be able to keep it up, and how can you make your fitness routine stick? 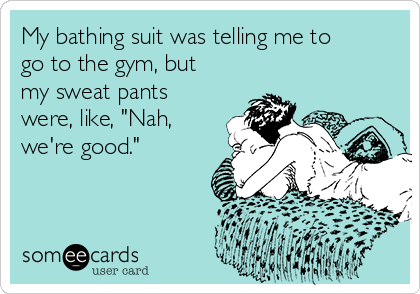 It can be tough to keep to your fitness goals and routine in the winter, especially when your bathing suit is telling you to go to the gym, but your sweatpants are like, “nah girl, you’re good.” Ha! 1. Find a (reliable) workout bud. Accountability is a beautiful thing especially when it comes to working out. Find a friend or acquaintance that has similar fitness goals to you as you both embark on getting toned, fit, and healthy together! The key here is to choose someone you can rely on to pump you up and encourage you. Nothing is worse than a gym partner who tells you, “There’s always tomorrow” or “It’s just one cookie!” In fact, try to find someone who inspires you and who will take your goals to the next level! Who says you have to limit your workout to the walls of a gym? If going to the gym isn’t your thing that is totally fine. Find other ways to keep fit – join a running club, play tennis with a friend a few times per week, grab a yoga class every Saturday. Find what type of fitness routines get you excited and go for it. There is no right or wrong way to get active – just do it (thank you, Nike). Whether it be with a mobile app or your FitBit, keeping track of your steps, mileage, or workouts can really help you see your progress. Tracking your workouts and/or steps will help you see how you can improve or challenge yourself even further. I don’t have a FitBit (yet!) but I’ve found that the built-in Health app on my iPhone has helped me keep track of my daily steps. While I don’t lug my phone around with me 24/7, it still gives me a pretty good idea of how active I have been each day. Side note: Thank you CaseApp via shanndelier for my iPhone case! If you’re picky like me when it comes to phone cases – opt for designing your own smart phone case via CaseApp! CaseApp is seriously so easy to use and I LOVED how my case turned out. 4. Invest in new workout clothes. For some, all it might take to get motivated and out the door is some new workout gear. I mean if you look the part you can play the part, am I right? Invest in some new shorts, leggings, tanks, and headbands – whatever it takes to get you motivated and feeling good to get your fitness on! If you are working hard and you’re still keeping to your fitness goals, reward yourself – you deserve it! When you have an immediate goal to look forward to it makes it easier to crank out another set of burpees or sit-ups.